I am part of the millennial generation, born between 1981 and 2000. As a young child, my parents got this nifty new thing called internet (dial-up of course). I grew up right alongside Harry Potter, book by book. The start of my high school freshman year coincided with the terrible tragedy of 9/11. I remember being about to graduate from college in 2009 and bracing for the impact of a deflated job market during the height of the recession. As we grew up, millennials, more than any previous generation, have defied societal norms, such as delaying the age we marry, start families, and settle down. We have challenged notions of gender identity and roles, religion, and spirituality. I would argue millennials have taken the bull of post-modernism by the horns and got it to take selfies with us. We are who we want to be, how we want to be, and no one can tell us otherwise. Millennials love Jesus. The church? Not so much. According to a Pew Research Center survey, 36% of millennials reject any religious affiliation (http://www.pewforum.org/religious-landscape-study/generational-cohort/youngermillennial/), double the proportion of our parents’ generation (Baby Boomers). As survey trends seem to suggest, this figure may only grow with each younger generation. How does the church stay connected to the hearts and minds of my generation and those after it? Before I continue, here’s a parenthesis and a reminder: I am just one millennial in America, so my viewpoint is limited. I also make a lot of generalizations about the American church. However, in my experience with my peers, there is a deep respect and admiration for the person of Jesus, while at the same time a visceral cynicism and aversion towards the church. In the rest of my article, I will speak to one thing the church can do better on. Millennials are strongly defined by our emphatic embrace of social justice. According to a Gallup poll, we are driven to make our communities, our nation and the world a better place. One foundation survey found that more than 70 percent of millennials spent at least an hour volunteering per year. Millennials tend to give frequently, in small amounts, to various causes and charities. When it comes to our jobs and vocation, I know that beyond taking home a paycheck, so many of us value feeling fulfilled and connected to a bigger purpose. In a society where there is so much to be cynical about, Jesus has proven to be the real deal. Millennials have a fondness towards Jesus because he had boundless, radical compassion. He disrupted the norms of “good religion” in order to usher in a more equitable society. He spoke to those no one would speak to (John 4:4-42, Samaritan woman at the well). He gave up his time to rest to feed the masses (Matthew 14:13-21, miracle of the loaves and fishes). He defied the religious authorities in order to heal the afflicted (Mark 3:1-6, healing on the Sabbath). That audacious spirit is something that resonates with the millennial generation, which yearns for a productive shock to a tepid, indifferent society. Churches, on the other hand, often seem more concerned about the comfort of its members or image, such as what coffee to serve or what font to use for their marketing materials, than the concerns of Jesus. So often, churches stay in the comfort of their insulated bubbles, too timid to get involved in the messiness of what’s “out there.” Ministries are often limited to one-time big splash events. Churches may form in or relocate to an inner-city neighborhood to obtain that hip urban vibe, but never actually forge relationships with any of its neighbors. Churches may say they are welcoming or that God’s love is for all, but when you look inside, everyone in attendance is largely in the same socioeconomic class. Millennials can smell the hypocrisy of an institution that preaches “love thy neighbor,” but allows injustices and inequality to persist. Granted, churches need to exercise discernment when wading into the sociopolitical fray. 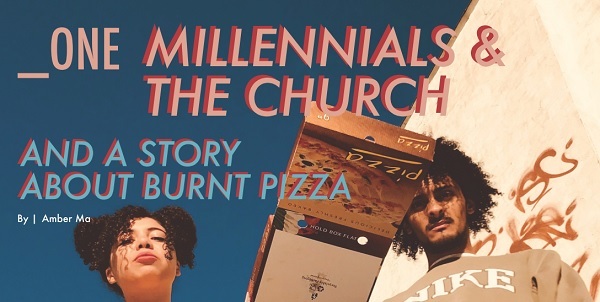 However, at a time in American society where there is so much to speak up for, churches that stay quiet may quite possibly lose my generation. As someone who has been involved with ministry and church leadership for ten years and is married to a pastor (also a fellow millennial) passionate about urban ministry, I have one piece of advice for churches who wish to emulate Jesus’ enduring concern of others: embrace messiness. At a church we used to attend, my husband ran a small youth program for teenagers who lived in the city. The program entailed creating marketable projects related to food, art, clothing, and accessories. One Sunday, while they were doing projects and making snacks, one of the teenagers put a piece of pizza in the microwave and accidentally set it to 10 minutes instead of one. When he realized this mistake, it was too late. There was no fi re, but smoke had wafted through the building in plumes, setting off the alarm and forcing everyone to evacuate. The church leaders were displeased by this incident and ordered my husband to disaffiliate the program from the church immediately. “It’s getting late.” “This is a remote place.” “They can go buy themselves some food.” Th ese excuses often echo those of the church today. How easily are churches, and even the leaders themselves, driven by their moods or timing and convenience, and in turn hinder the love of Jesus? As conduits of the gospel, churches must be authentic in living out the call of Jesus, which is more about radical transformation than light and easy commitments. Millennials want to be part of change, a passion that is magnified when harnessed by God’s Spirit. Churches can harness this energy by willing themselves to wade into the scary and messy world and be there for it, nurture it, love it (Matthew 5:14, be the light of the world). Pray about and stand up for something, even if it is controversial, because it is the right thing to do. In a time of infinite distractions and issues facing the world, it is this radical compassion and Spirit-led boldness that will resonate with a cynical, defiant generation and the generations to come. Amber Ma lives in Providence, RI with her husband Scott and tuxedo cat Sonia. She attends International Alliance Church, where her husband Scott is the lead pastor. In her free time, she might be found tending her vegetable and herb garden or cycling along a bike path.